When I moved back to Manchester, I had expected that at least during the commute, I would not have any internet. Little did I know that due to a problem with Virgin Media and BT, we apparently won’t be having internet for a ridiculous 4 weeks. This is going to make things difficult. I need internet, and FAST internet to blog, watch/upload videos, do research and Uni work (accessing lots of cloud files), keep in touch with folks over skype video etc. 3) WiFi sharing from Mobile. Simple enough to use, plug over USB. A little expensive. About £34 for 3GB. Plus only the person where the PC is plugged in can really use it. There’s no simple option to share WiFi. Mobile WiFi. Slightly larger than a dongle, in various sizes. Multiple users can log on. Pretty expensive for a short term use. £85 for 3GB. I’ve got my N8 and a loan SGS2. By default, SGS2 has WiFi sharing built in. That is buried in menus and is quite temperamental. JoikuSpot is an app you can buy from Ovi Store for £8. It is included in some Nokia smartphones by default (PLUS there’s a free version – I’d recommend going premium as you can secure your connection). This is as simple as Start>Stop. Unless you don’t have unlimited data or any data plan what so ever, then you’re paying either £8 or £0 if you already have built in options. Make sure you DO have a data plan if you’re on contract as you may rack up a HUUUGE bill. The worst on pay as you go is that you limit your balance to 0. Another thing to remember is to keep your phone charged. N8 lasts about a normal day if just used as a WiFi connection, whilst the SGS 2 dies in about 3 hours. 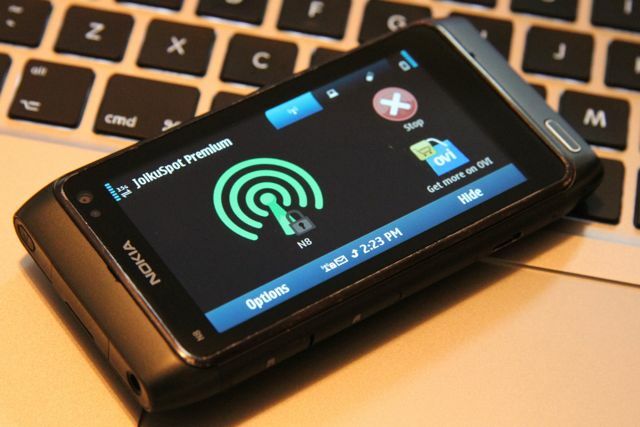 With Ovi Suite installed, you can plug your Nokia phone over USB and use your mobile data. This is free. You’ll also get some smart notifications when you reach certain thresholds to remind you to be a little more economical with your data. Again, make sure you do have a data plan or bundle with pay and go. No need to worry about charging the device as most likely it will charge when connected to PC via cable. « 4squick v0.96 Beta available at Ovi Store.